This gremlin is made of Whisper, which I liked better than I thought I would! It stays far more opaque than expected – again, the body is over clear and has a bit more misty translucence, but the lips are opaque enough not to let the teeth show through (which is good as it can look kinda scary!). This is rather like Frangipani, but a bit less pink, I think. Like a very diluted one of the plum uniques. It gets the same slight webbing on the surface as you work it. This rod of Whisper was pretty shocky – I had to baby it back into the flame to stop it shocking off above where I had been working, and when adding the upper lip I must have got the flame too close to a cooler section, as it shocked right off, leaving me with a half-applied lip ending in a centimetre of rod. In hand to make it stand out a bit better from the background. Primrose is a rather pretty pink (but primroses are yellow!). This rod was really shocky though – worse than Whisper – and it would crack about an inch above the end every time I took it out of the flame and put it down, so when I next had to use it, I needed to not only bring it back slowly high up in the flame, but make sure I got that whole bottom inch heated up before using it. Again, it cracked off while doing the top lip. 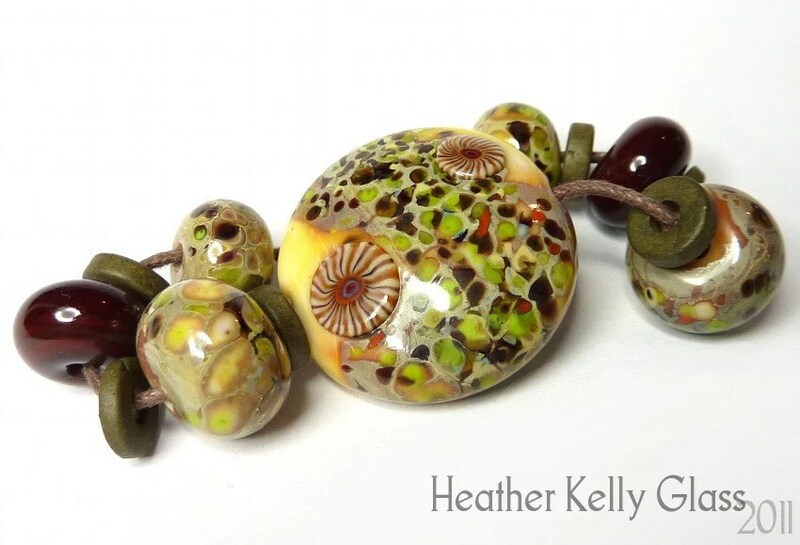 The actual colour is really nice, and the glass is fine to work with once molten, but you do need to be careful. I imagine using this for one-at-a-time dots would strain one’s patience. I don’t know if this will be the case with all rods of Primrose or if this was a particularly nasty one, but for a rod without airbubbles running through it this was pretty bad (those just tend to explode in all directions). I was using it alongside a thick Effetre clear rod for the cores, which can have a tendency to crack at the end when cooling just because it’s bigger, hence needing to go back in carefully enough to melt those cracks (but they do heal quickly again). That was far less hassle to use than the Primrose. I don’t even know if keeping the end preheated would help, because it might just shock above that. A lot of rods do the “crack a bit when you put them down” thing, but usually it’s just at the tip and there’s no real problem. What was unusual here was how far down it cracked, which is what made it harder to use. I use a rod rest, so wasn’t putting it down on a surface either. Coronation Day is a dark opal purple. I like this one – nice to use, pretty colour. It’s very like some of the darker plum uniques, again, but I’d need to put them side by side to check differences. You may be able to see here – the feet and bottom lip have opacified and lightened more, while the top stayed darker and more translucent. This is the same thing a lot of the CiM opals do, and depends on how much heating and cooling they get after the last time they were molten (and mayybe on kiln position too). I added the little yellow flowers on the head after doing the feet, but didn’t melt the head while doing that. Bubblebath is a similar shade to Whisper in a pale rose quartz kind of way, but far more translucent. The body over clear is very transparent, and I didn’t even try using it for the lips and eyelid, so those are Coronation Day again. I should do some transparent styles of bead with this – could be interesting encasing something shiny, and should make lovely nuggets on its own. Creation Is Messy have sent me some more colours to test! 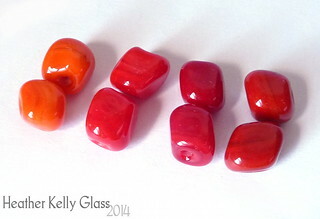 This post is for some juicy reds and oranges. 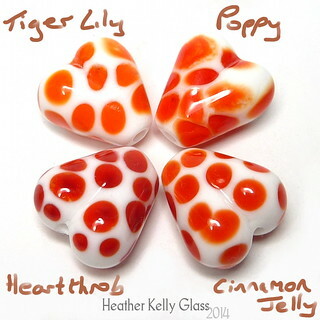 Tiger Lily is a semi-opaque/semi-transparent orange (whichever way round you prefer to describe these!). I used a core of clear for these gremlins, so you can see where that changes or doesn’t change the body colour. 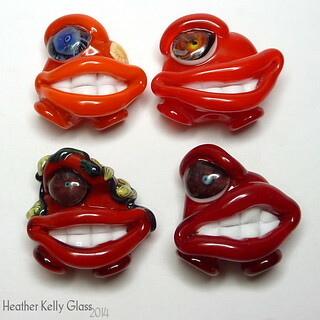 Here you can see there’s a difference between the body and lips, but the body is still opaque enough not to see through. It is also streakier. Poppy is a bright light red, also semi-opaque. It came out fairly uniform here, whether over clear or not. Heartthrob is a darker semi-opaque red, more of a blood red. This colour darkens more under halogens than the others, so is a tad brighter in sunlight, but still darker than Poppy. Again quite uniform in colour. Cinnamon Jelly is streakier and more transparent than the others – you can see that a bit at the corners of the mouth. It’s a dark orange-red. Here’re the red gremlins side-by-side. I also used these four colours to make dots over Effetre white. Tiger Lily and Poppy had a bit of a tendency to bubble on the rod as I was making dots, which are the smeary ones. Possibly should have done that cooler. I had the base shape a little smaller on the other two, so they fit the press better and were worked less. Side by side, which stops the white bases melding into the background. I made a pair of nuggets in each colour as well. You can see that Cinnamon Jelly is definitely the streakiest, and also the least opaque when used solidly like this. Tiger Lily and Poppy are lovely and bright, and again Heartthrob can look a little brighter in sunlight. ETA: Here’s a pic in sunlight. You can see Heartthrob is lighter, though we also have a problem with them all being oversaturated by the camera… The Heartthrob gremlin on its own is a reasonably accurate representation.